With our upcoming Manifestation workshop, I thought I share a few of my personal stories with you that have been initiated by exactly such “Manifestation” Days or Periods. I always find that when I can get a glimpse of other people’s lives and how they managed through difficult periods, how they dealt with trauma or loss or how they transformed their lives, it gives me inspiration and fills me with a feeling of possibility – and a sense that I’m not alone and others have walked similar paths. As many of you know, I had my share of accidents and injuries and while they are debilitating, painful and challenging (to say the least), for me they always carried an element of incubation, growth, transformation and the acquisition of new habits – and not giving up hope! Let’s start with me quitting my job as a research scientist to fulfill the dream of opening a yoga school with my partner Andrew. One month into my new-found freedom of not having to answer to any bosses, practicing yoga, climbing and eagerly looking for a place to establish our yoga school, I fractured my heel and my ankle. To cut a long story short – breaking anything is bad, but your heel is something that heals extremely slowly, and ankles are complicated structures. I ended up with 11 screws and a plate in my foot and a physio who was doubtful whether I would ever be able to walk normally again. During the 3 months in a cast and another month in a moon-boot I had times where I was just so angry and sad that this had happened and that my active life had been reduced to hobbling around on crutches. And I had to remind myself what I still was ABLE to do: reading, writing, simple yoga stretching (including headstands ) and sitting (by the way, I also still managed to climb: https://www.youtube.com/watch?v=Wn2JBSS7o7o ). Reading allowed me to absorb myself in detail in Yoga Philosophy and helped me to do what had been difficult for me in the past: Meditate! 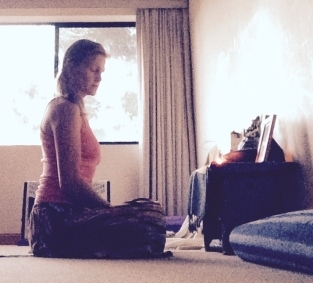 Meditation was part of my practice, but it wasn’t something that I looked forward to like my asana practice and it was more like a dutiful routine that I got through. With all the time that I had while I was recovering, it was easy for my thoughts to drag me into depressing regions. And it was meditation and pranayama (and Andrew) that really prevented me from spiraling into a dark hole. Meditation became a place for me where I could be without pain, without thought and with a beautiful calmness and quietness. 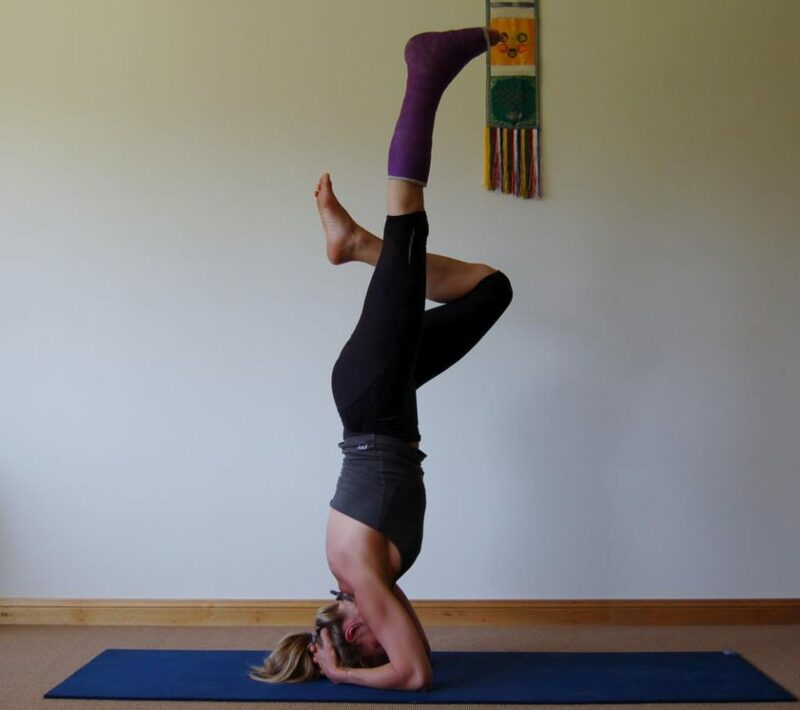 Needless to say, I did recover from the injury and learned to walk normally again and we did open our beloved yoga school – and the right place just came up at the right time: one month after I could finally ditch my moon boot! I never had the perfect yoga body – you know the one where you can effortlessly bend and flex and jump and twist. I had to work hard – and most importantly: long – for every little bit of flexibility and strength that I have now – and the journey is far from over. What my fellow practioners seem to accomplish in a few months, took me more like a year if not longer. And some postures were just dreamscape for me. At first it was any kind of backbend, because I suffered from chronic backpain and the thought of backbends made the sweat break out without having done anything. With visualisation, patience, weaning myself off painkillers and with small baby steps I inched myself closer to backbends. Years later, I enviously looked at my friends that were dropping from standing into a backbend – and then coming back up! “In my next life” I thought. Yet, again, yoga proved me wrong and while my drop-backs don’t look as graceful as those of others, years and years of practice overcoming the fear, working on my stiff back and believing and trusting finally got me somewhere. And then there was king pigeon pose: I began working on this pose about 5 years ago – and I felt stuck and allowed myself to find excuses like “You are not a 22- year-old anymore” to kind of, sort of give up. And then I had my shoulder reconstruction 2 years ago and this is when I thought that I could kiss the pose good-bye. And something weird happened: the preparation for the pose is wonderful for shoulder opening – and this is what I was working on to bring the flexibility back into the shoulder. And then I just playfully worked with the strap to see if I could go any deeper – and then, 6 months ago, I was able to bind! Meaning holding my foot! All these examples can serve as a reminder that yoga takes us from places of impossibilities to places of possibilities – and that it takes time, a long time and patience and the quiet, positive belief that something will transpire down the track. Okay, I finally had to acknowledge that, yes, I am going through menopause: sleeping is interrupted, the body feels hotter than usual and the belly suddenly seems to stick out and wobbles. And while I understand that these changes are inevitable, and we have to accept those, I believe we can also use this transformation to not let things get out of control and regain health, vibrancy and a better muscle tone. Firstly, I had to acknowledge the bad habits that had crept into my life: due to my days being governed by teaching and practicing yoga, my eating routine consistently changes – and that has led to too much snacking during the day, too much coffee and lacking time for proper meals during the day. A while ago a friend of mine mentioned a wellness product line that was all about increasing energy and performance, reducing excess weight and promoting healthy aging. I didn’t think I needed it, so I kept dabbling with ‘trying’ to ‘fix’ my problem – but the gut remained, and the energy wasn’t picking up. So, I thought to myself, I give their 30-day program a try – and I decided that it needed to be a holistic program for me: not only did I want to cleanse, refuel and re-energize my body, I also wanted to cleanse and refresh my mind. So I need to let you in on what has been my nemesis for years: Fear, insecurity and a paralytic resp onse to anger. There you have it! Fear and insecurity can sometimes be expressed as over-confidence, a putting on of a ‘show’ while deep inside you go into a silent panic mode – because nobody was allowed to see how scared I was and how much I doubted myself. Not feeling good enough, getting upset about the slightest mistakes I made and apologizing for things that I didn’t need to apologize for where all parts of my personality that I had a gutful of! Mind you, since I started to practice yoga, I had been able to deal with those issues better, but the ugly heads of Medusa in form of these traits kept coming back. So, my aim during this 30-day program was to really, consciously pause before reacting to an email, a comment or a thought. And if a situation was confrontational, I forced myself to not go into fear mode but to see it as a challenge and a lesson that I could learn form, i.e. something positive! The philosophy of the stoics is great because they lived according to the worst possible outcome associated with a challenge – and what the outcome would be if we avoided the challenge. So, when I played through in my mind what could possibly go wrong, it was benign! But what I could learn from it was immense. So, over those 30 days, there were definite physical improvements: I felt better physically, lost a bit of belly fat and had more strength and energy – but what was truly remarkable that my mind had changed from tending towards the negative to actively looking for challenges and seeing positive possibilities. I hope that one of these 3 little stories can resonate with you and you can take inspiration or hope to make changes in your life or start on your journey. I will talk a bit more in the workshop about the specific tools that I used, how to deal with ‘set-backs’, how to get back on track if you lost it and how to build – one breath by one breath – that inner confidence that YOU CAN DO IT! Tagged Asana, Healing, Meditation, Yoga.